Located at the feet and gate to the Rocks, Alsos House is a bed and breakfast accommodation at the Old Town of Kalambaka (the area is called Sopotos) right under the rocks of Meteora. The location is ideal and the visitor has eye contact with the amazing land scape all the time. 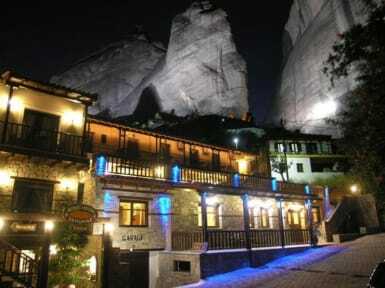 All rooms with balcony and view to the rocks of Meteora. Alsos house is located in the old part of Kalambaka, where the visitor can feel the breath of the rocks over his head. Footpaths connect the lodging with the monasteries at a 25 minutes walking from the house. Feel free to feel the energy that created the rocks since the beginning of time. Maps, guides, directions, climbing information to climb if you wish, tips to walk the ancient secret monk paths will make your stay enjoyable.